It weighs just 1.9 pounds empty. 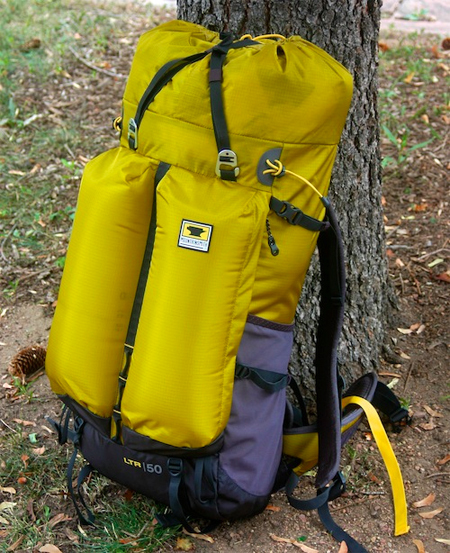 When loaded, the Mountainsmith Haze can carry 50 liters’ worth of gear — enough for a week-long trip if you pack right. We got a sneak peek at the to-be-released pack last week. The occasion was an event in Boulder, Colo., and while we only hiked a bit with the pack on it felt solid and well-designed. What makes it different? It’ll be a good deal to start, at msrp $129, when it’s released in early 2013. For the hiker counting ounces who doesn’t want to skimp on a pack with a few key features, the Haze seems like a nice in between — the build is light and simple, but features abound. There’s a big, open main body, outer mesh stuff pockets, pole carriers, ice axe loops, and two smaller outer pockets that make organizing gear easier than what you get with lighter “sack”-style packs. The Haze eliminates not only the frame (it has a simple foam back-sheet) but also the lid. The lid is replaced with a dust cover and two straps that can be crossed or run in parallel over the top opening and cinched down to hold it shut. It uses thin but tough rip-stop nylon and heavier fabric in high-use areas on the bottom. While lightweight, the Haze still employs Mountainsmith’s unique hip belt design and lumbar padding, which are advertised to transfer weight better to the user’s skeleton and minimize shoulder load. For those going super light, the 12mm thick foam back-sheet can be removed and used as a sleeping pad at night. This lets you leave a normal sleeping pad at home, cutting more weight. 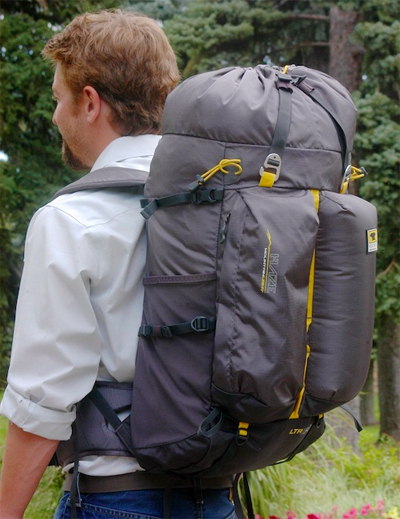 Overall, the Haze looks to be a solid entry into the ultra-light backpacking realm. Its fair price and solid build might make it a top pick next year for those hoping to go “faster and lighter” on the trail and in the wilds.